Your wedding day is one of the most important days of your life and having a wedding video production to capture is an unbeatable way to cherish those memories and share the day with those who cannot be present. Videod is a market leader in wedding video production and has also pioneered the DIY style wedding video to allow our customers even greater control. Our award winning video production team are available for just a limited number of full production videos and make use of high end film equipment, drones and stabilisation systems to ensure the video produced is unparalleled. The attention to detail we show to all of the content we create means customers can relax and enjoy their day without spending a thought on the quality of video being captured. Our unrivalled experience means we can offer individualised packages for traditional English weddings but also for other cultures and styles of wedding including Muslim, Asian, Hundi, West Indian, Jewish and Fusion weddings. We can also provide an all-female crew if required. There are many options available for your wedding package. For example, we can live stream the wedding to a private channel for guests to see who cannot attend. We can send the content to a Facebook page to allow friends and family overseas to enjoy the event. We also currently offer a full wedding video production service during midweek days for £750 and for weekend dates for £850 so to get the package you desire at a top price, get in touch with us as soon as you have your dates to ensure you can get both the time and price that you want. And for more information about the exact details of the package you require, simply call us or use one of the contact options below to discuss your needs further. Saw a shoot your own wedding website wanted £800 a videographer wanted £1600 went to Vid4 shot it ourself and had a high quality edit for £300!!! Perfect!!! 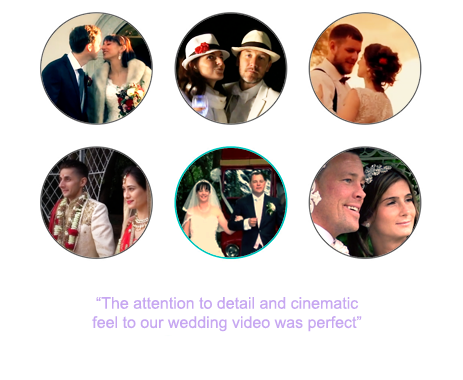 When you first approach Videod about your wedding video production, you will quickly see how passionate we are about creating visually stunning videos and we love creating memorable wedding films we so we will start gathering information about your needs and requirements. This is the stage when we first discuss what services you may require like aerial footage, live streaming or a more traditional wedding film. We can help either way. If you choose to take the full package and save yourself any concerns about the actual filming, then we can start to plan what is required to do just this. Our planning process aims to lay out everything you need as well as time scales and locations for the wedding as well as any additional filming that you require. You can specify the additional services you may require for your wedding video production below or you can take advantage of our current offer for straight forward wedding video production of £750 for midweek weddings or £850 for weekend weddings but this is a limited offer so secure your dates as quickly as you can..
Once you have decided on your big date we will arrange for you to meet your video producer in person so you can work together on getting the very best results and delivering the style of wedding film hat you had in mind. Once we have established what you need, we can then move through our process. If we are doing the filming, this will involve filming the event then our production team can take over and deal with the footage. We can also help with the technical side of showing your content to others once it is complete so that everyone can enjoy the day. The first stage in arranging a wedding video production is the planning stage. Just like you have planned your wedding to ensure everything goes just as you desire, we too plan your wedding video to make certain everything is perfect. Our experienced crew know what they need to do but we like our customers to have a complete understanding of the process too so that you can incorporate it into your day. Firstly, we will establish what parts of the day you require to be filmed. Some couples like the whole ceremony, the full reception and the evening event to be captured while others only like portions. Some enjoy having footage from before the ceremony to add to the build-up. Whatever the ideas you have for your wedding video, we can formulate them into a firm plan that allows us to slip unobtrusively into your day. If you plan to have a DIY wedding video production, then this planning stage is where we help you get the knowledge to do this. This might mean bringing the people who will be using the equipment to us to receive training on it or to access the tutorials that we offer. We also have 24-hour support so don’t worry if something goes wrong – we are always around to help. The plan may incorporate additional equipment or services that you have booked and how these will work. It may involve us visiting the location or locations for the wedding to check the technical aspects before the day. Whatever we need, we will let you know when we form this plan so that you can always feel informed about what is going on. Once the plan is in place, we can then wait for the big day to come around and the filming side of the production to take place. Filming your wedding video production is one of our specialities and therefore we have a simple et comprehensive system in place to ensure we do the very best job. Whether you are having a traditional English style wedding, an Asian, Muslim, Hindu, Jewish or West Indian wedding, even if you are having a Fusion style wedding, we can adapt that filming technique to ensure we capture everything that you require. One of our aims when filming your wedding is to be as invisible as possible. People often feel self-conscious when they are on video and this affects their reactions. Our aim is to capture people in as natural a way as possible. We also use the very latest in technology including drones to capture the kind of footage that simply wasn’t possible a few years ago. Part of the options for your filming includes live streaming the event to a private channel or even to a wedding website or Facebook page. This might mean the use of some specialists sound or lighting equipment so we may visit the location before the event to ensure this is all in place and that it is as unobtrusive as possible. When we plan the event with you, we will know exactly what and where we will be filming and can go about this without further input from you. If you want us to talk to anyone as part of the filming, we can arrange this or if you want footage from around the venue capturing, again we can organise this with the owners of the building. If you are shooting your own wedding video, then we are on hand to help if there are any problems. We offer 24 hour support and have plenty of tutorials to study beforehand so that whoever is taking the footage has all the knowledge they need. The production side of the wedding video production is where our experience, expertise and advanced equipment comes into the process. As expert video content creators, we have created high quality content for businesses around the world and also for weddings of almost every style imaginable. This all adds together to mean we have a top quality production team to work on that raw footage to create the finished video content you desire. 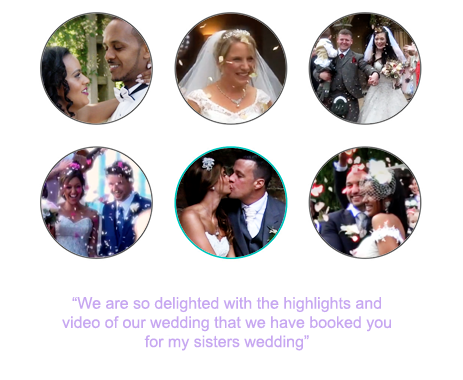 Once the raw footage has been collected, we can often put together a short sample for a quick turnaround to let you and your closest family and friends have a sneak preview of the full package. After this, we will continue with the full production and editing of the video in line with the dates laid out in the initial plan. If you required any kind of graphic design elements to the footage including watermarking or other additions, then our graphic design team will step in at this stage and add their touches to the piece. Once everyone has finished with their editing, the content is released via our private channel for you to view. Only when you are completely happy with the edit and all the content, will we formally close down the production side of things. The video content will be available to download from the channel to then make hard copies to send to friends and family. You can also put it on a YouTube channel, on Facebook or if you have a wedding website, you can create a password protected section that only friends and family can access to see the footage. We can also offer production services for content that you have collected yourself with our equipment as part of a DIY wedding video production. This means that you can have the finished content you desire to show friends and family around the world. Once you have this expertly produced video content from your big day, the question then turns to what can you do with it to easily allow friends and family to view it? We have a number of different options available that can allow you to share your big day with people around the world and create quality keepsakes from the content for others. Live streaming has taken the video world by storm and is now available for weddings just the same with corporate events. You can create a live streaming location such as your wedding website, a Facebook Page or even a YouTube channel. If you want to be certain that only people you invite can see it, we can help you make the content password protected and show you how to distribute this to your friends and family. As well as live streaming, these avenues are also a great way for people to see the event afterwards. Even guests who attended the wedding will often love to watch the footage, catch all those little moments they missed the first time around and smile again at the stuff that made them smile on the day. Again, avenues for viewing this content can include Facebook, YouTube and a wedding website. Creating copies of the footage also make great mementoes for important people in the day such as parents, bridesmaids and the best man. We can even look at editing certain sections together to create highlights from certain people to make a very special keepsake. Showing your video to friends and family is something often done in front of a big screen as part of an after-party and the quality of the footage that we create is so good that this will make it like a movie night. That way you can relive the day and share it with those who couldn’t make it on the day. Whilst the majority of our clients look for their conference to be filmed in full HD we can also provide 4K footage for a small surcharge to present your conference at its best. Live streaming allows your video to be shared privately or via channels such as YouTube Or Google. We can embed your video feed onto your website or provide a link for viewers to gain access to your stream. You can choose to have the video stream recorded so it can be watched again and again and viewers can rewind to ensure they don’t miss any of the action. If your venue is providing the PA system normally wireless lapel mics, microphones and speakers the we would take a feed from their sound desk. If you would rather we cover the audio for you as well then you can select no and select the audio equipment you would like us to provide in the other options. A PA system allows your speakers to have a microphone and this will be connected to the PA system to allow clear recording of the talkers and an amplified solution to assist in the professional deliverance of talks. Our standard PA package includes 2 speakers a sound board and a thousand watt amplifier enough for the biggest of venues you can add additional mics in the options that follow. Our highlight video will give a fantastic overview of the event and this can be shared online with ease edited dynamically to capture the events of the day and will be turned around once the filming is complete. The full edit represents all the footage filmed with titles and sliders inserted a basic overview video can be provided within 48 hours of the filming completion, for more complex slide insertion etc please contact us for a price dependant on the complexity of the required edit. All the raw footage from our filming is available at no charge. Keeping your staff or clients up to date on the events of the day is simple by using our Social Media Feed we can provide an informative video thats feed through to twitter and Facebook we can do this in varying levels or we can tailor a package for you just let one of the team know what you need and we will make it happen on the day. All prices quoted above are for venues within the M25 we cover national and international venues and a surcharge may apply, we will confirm any additional travel costs before processing your booking.